Someone asked for a tutorial for these, so I volunteered. I made the satin, pink one first, which was kinda tricky being that it is slick material, then I made the red and white one. It turned out better, as I was practicing first before I started the how-to pix. The satin one I wasn't too pleased with the corners. They were more rounded than squared, which was the look I was going for. Cut 2 4 X 6 pieces for the bow, and 1 2 X 4 piece for the tie. You can pretty much make your bow any size you want, these are just the measurements I used for this particular bow. Start about 1/3 on the the longest side of the bow, 1/4 inch from the edge or with the material even with the edge of your presser foot. Continue to sew all the way around. Tip: Back space at every corner before turning to make it more stable after turning it right-side out. 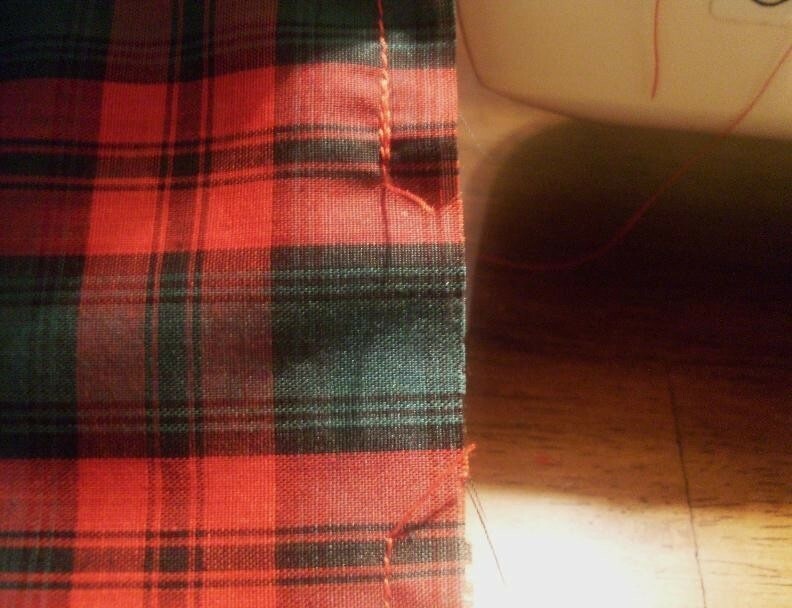 Sew 1/3 from the opposite side that you started from, leaving 1/3 opening in the middle. 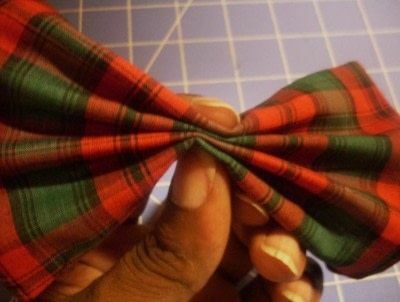 Fold tie in half and use same seam allowance used for the bow. 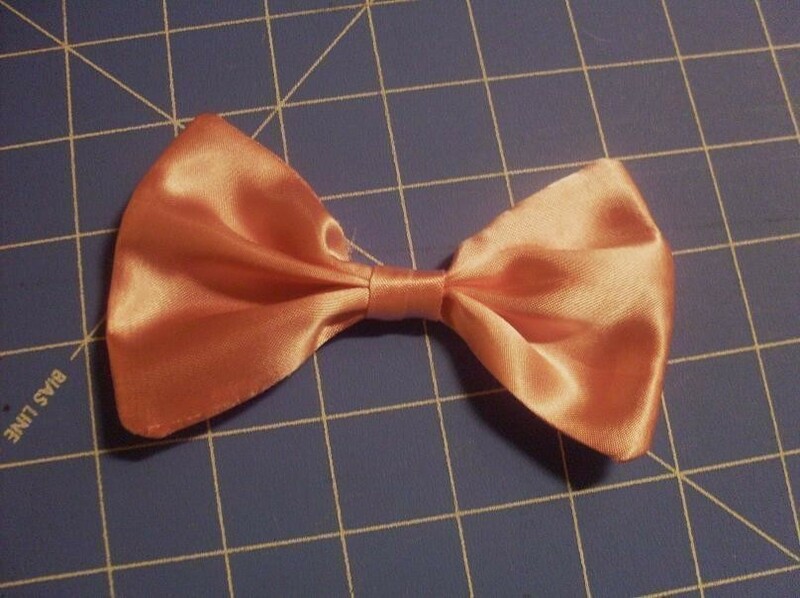 Snip all corners on the bow with pinking shears or other scissors. Continue to trim all sides down to half of the seam allowance. DO NOT trim the side with the opening. 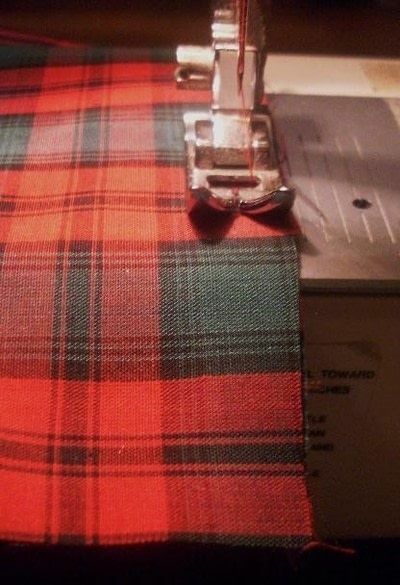 Also trim the seam on the tie. Turn bow right-side out. 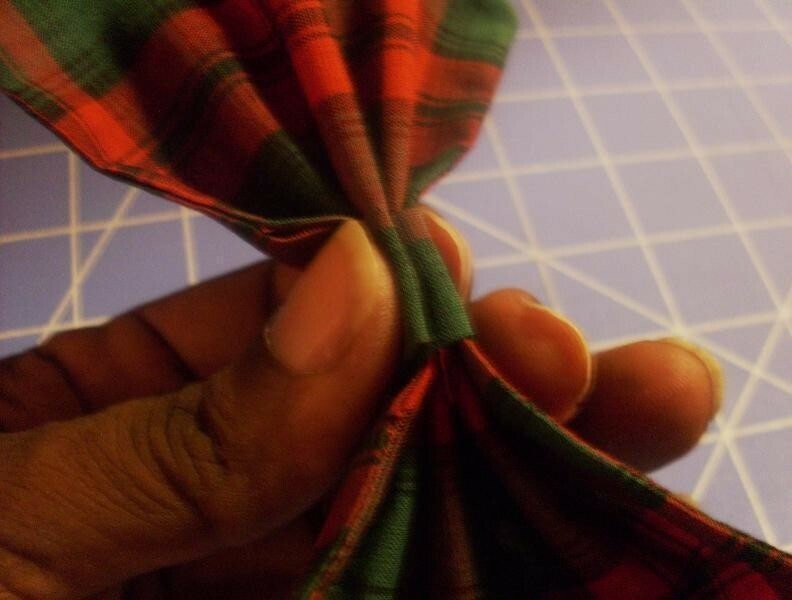 Use something with a point but not sharp to push out the corners to a point and roll the edges of the bow to the seam. 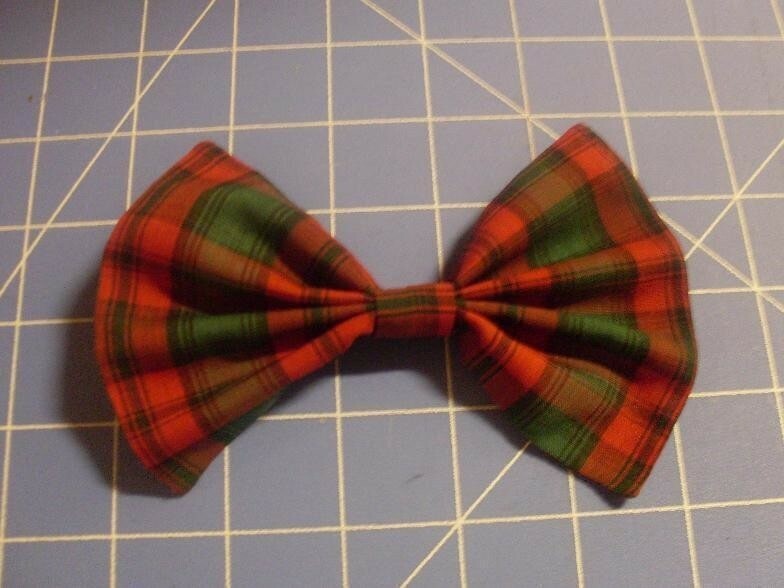 Press both the bow and tie as shown. 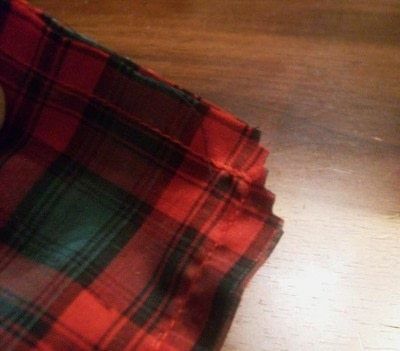 Depending on the material you use and if you choose, you can use starch to make your bow part a tad more stiff. I didn't use any. Note: I didn't sew the opening shut but it's your choice you want to do that or not. Accordian roll the bow in the middle, making sure that the seamed edges are both turned in the same direction when done. I made seven folds to achieve this. If you make a larger bow then you may need to fold it more times than I did. 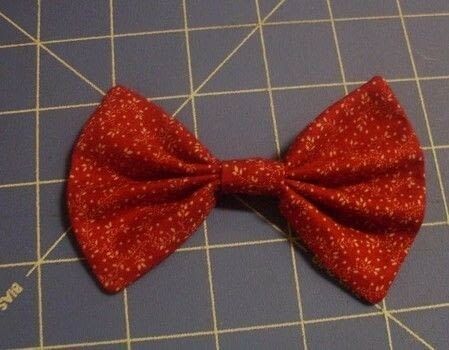 For the practice bows, I made 3 folds, which are slightly smaller. Place tie on the side of the bow with the seam facing down as shown. Continue wrapping bowing slightly loose to overlap the starting point. 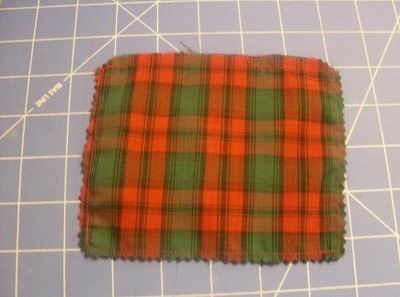 Trim and fold end under. 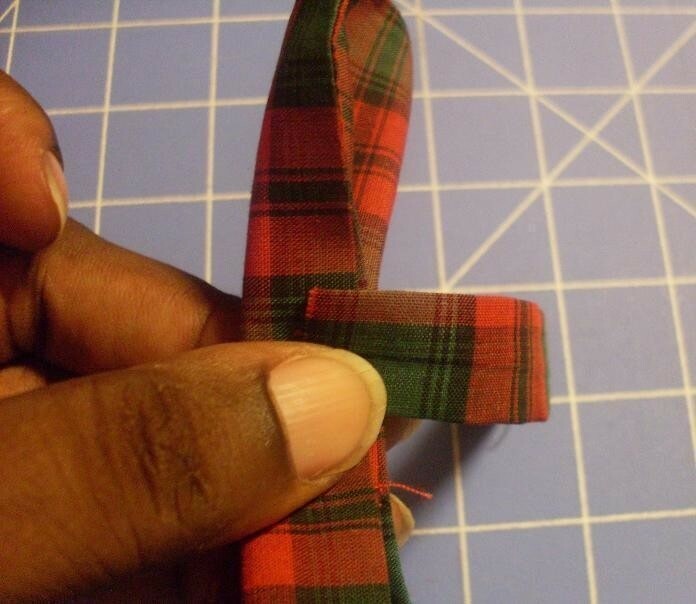 Use needle and thread to stitch tie closed and on each side of it, make a few stitches into the bow to hold it in place. 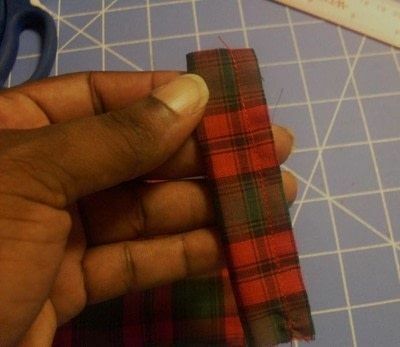 I didn't actually do the sewing part, I just pinned it for the moment. With your finger, kinda press and roll the middle to flatten the tie. Unfortunately at this point, my battery got low on my camera, so...well ya know. Now you can add a jewelry pin, barrette, clip, earring post or anything else you can think of to wear your bow. Would like to see your version Francesca! I've made two of them today, so easy!! Thanks a lot for sharing this!! Thanks a lot!! You are not just Creativemind, you also read-my-mind girl LOL. I'm having a Jigsaw costume (Billy puppet)this year and I was wondering how to do the bow (I know, I'll need more fabric, but your tutorial is my salvation now =D) Thanks for volunteering your tutorial is fantastic. Thanks for the tutorial! I'm going to try this. AHHH! I saw this in the "featured" spot and knew exactly what it was! Thanks so much! Those are exactly what I was wanting! I just got my 1st sewing machine (teaching myself to sew on a machine! NO MORE HAND SEWING!!!) so I'll have to go home a try these out!!! THANKS SO MUCH! Thank you all for favoriting and commenting on my project, which made it a feature this week!!! !